Stop me if you’re heard this one: now that Windows 10 isn’t free, home users will have to pay for a subscription. The article itself does not mention subscriptions, and neither did the leaked Microsoft material referenced. But I don’t blame the readers for making the leap, because in the outside world “as a service” implies a subscription fee. Not, apparently, in the world of Microsoft jargon. 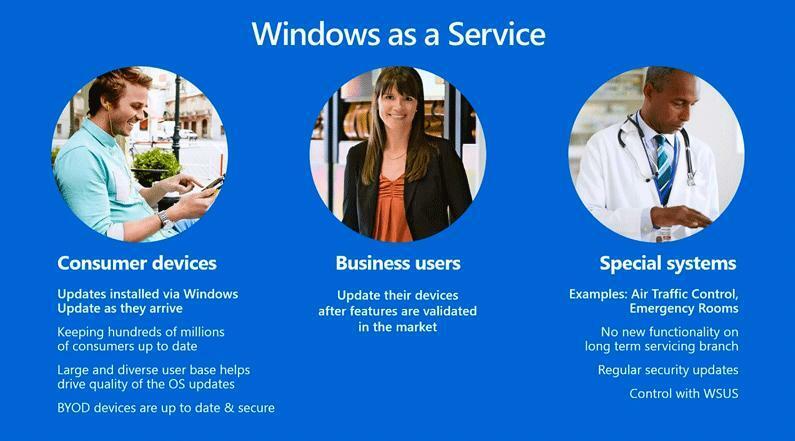 The company, to be fair, stopped using the phrase “Windows as a service” over a year ago. And I don’t know if that phrase was the original source of the subscription myth or not, which persists to this day. On the other hand, Microsoft hasn’t replaced “Windows as a service” with anything clearer, and to make matters worse, there is a subscription plan for enterprise customers. No wonder people are confused! Microsoft does itself no favors when it leans heavily on words and phrases that the outside world doesn’t understand. Reading Microsoft press releases and blog posts can feel like reading a foreign language, and that’s bound to lead to misunderstandings. A few weeks ago Microsoft announced, in the ultimate corporate-speak style blog post, that enterprise customers will soon be able to buy Windows 10 as part of a subscription service. Here is an actual sentence Microsoft thought was compelling enough to put in a pull quote. Today, we are announcing Windows 10 Enterprise E3 in CSP. Starting this fall, businesses can get enterprise-grade security and management capabilities at just $7 a seat per month for the first time through the Cloud Solution Provider channel. If you’ve no idea what you just read, you’re not alone. I get a headache just staring at it. To clarify, just a little bit, “Windows 10 Enterprise E3” is a new version of Windows aimed at the enterprise market. There will also be a “Windows 10 Enterprise E5,” which will cost more and have more features, just as there is an “Office 365 E3” and an “Office 365 E5.” You can never have too many versions of Windows, right? CSP, meanwhile, stands for “Cloud Service Provider,” which is a reseller program Microsoft offers with its own jargontastic home page. Apparently the cloud is an opportunity to increase profit with annuity-based revenue streams and high-margin service offerings and wait what’s happening? I nodded off there for a bit. This isn’t a post that’s meant for the average consumer, so it may seem unfair to knock Microsoft for it. But the company didn’t state in a post that the subscription plan doesn’t apply to consumer versions. This is a habit. Rumors, features, and options that target businesses often alarm home users. And little is done to fix that. Language that doesn’t clarify spawns confusion, and Microsoft seems to specialize in it. The subscription rumors are unfortunate, but hardly the only example of Microsoft getting lost in the jungle of its own jargon. Quickly, now — what is the name for the kind of programs sold in the Windows Store? You might say Metro apps, or Modern apps. You might say Windows Store apps, or Universal apps. You might even call them “Windows 8 style apps.” And you’d be sort of right to say any of those things, because Microsoft has officially used all of those and other names since first launching the Windows Store back in 2012. There’s been over four names for these things in as many years. Why all the changes? Well “Metro” was reportedly a copyright issue, and “Modern” implied that traditional desktop applications are mere legacy applications, which some developers didn’t exactly love. “Windows 8 style apps” had to die once Windows 10 came out, and I couldn’t guess as to why “Universal” and “Windows Store” had to go. The current official name is “Windows Apps,” which is actually still confusing. For over a half-decade users have called all applications “apps,” and applications that run on Windows “Windows apps.” But now, officially speaking, Firefox and Photoshop are not “Windows apps.” Unless they put a Universal Windows Platform version on the Windows Store. Microsoft, for its part, calls traditional .exe files “Desktop apps,” which at least allows for a distinction. But Windows is a desktop operating system, and desktop apps run just fine on Windows 10 tablets, and… well, now I’m just confused all over again. When it comes to Microsoft renaming things, there’s another, more famous example — Hotmail. Microsoft bought the free web mail service back in 1997. Since then, the product has been renamed four times. MSN Hotmail in 1997, when Microsoft was trying to support their butterfly-themed web portal. Windows Live Mail in 2005, when Microsoft managed to buy the domain “live.com” and decided to rename everything. Windows Live Hotmail later in 2005, when users got confused and demanded Microsoft make mail hot again. Outlook.com, in 2012, when Microsoft realized it already had an email program it could name a web mail service after. The result of all this is that hotmail.com, live.com, mail.live.com, and hotmail.live.com all re-direct to Outlook.com today, ensuring that your grandmother’s bookmark from 2003 continues to work (Microsoft did get that right). And Hotmail isn’t the only service to change names. What’s now called OneDrive was previously Sky Drive, Windows Live Sky Drive, and Windows Live Folders. At least it was never called MSN Drive. Constantly re-naming products seems superficial, particularly if you’re the sort of person who reads about tech constantly. But for the sort of user who just barely knows how to use a computer, re-naming something is akin to making it disappear entirely. And how are users supposed to make sense of an announcement if they’re not even sure what a product is called? Now, to be fair, Microsoft is far from alone in getting lost inside its own jargon and brands. Google could teach a graduate-level course on terrible product names, and Apple has its own naming quirks (early 2000s: “Add an ‘i’ to every name!”; 2010s: “Ditch the ‘i’s!). But Microsoft has a communication style all its own, one that’s both uniquely incomprehensible and strangely familiar. When I see a phrase like “enable digital transformation by delivering more personal computing across Windows and our devices,” I don’t know what it means. But I sure do know it’s Microsoft saying it. Don’t expect this to change anytime soon. This isn’t a problem with the tech — instead, it’s a symptom of Microsoft’s growth over the decades. It’s a large company, famous for internal divisions that don’t always cooperate well, and it simultaneously focuses on enterprise and consumers. There’s a lot going on, and a lot of internal momentum. This part of Microsoft isn’t going to change any time soon. In fact, as the company becomes deeply entrenched in providing cloud services, it may become worse. We’ll have to keep trying to explain its jargon when we see it.